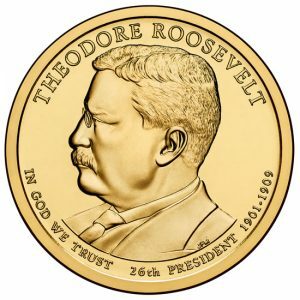 At noon today, Thursday April 11, 2013, the United States Mint released Presidential $1 Coins honoring Theodore Roosevelt, the 26th President of the United States. 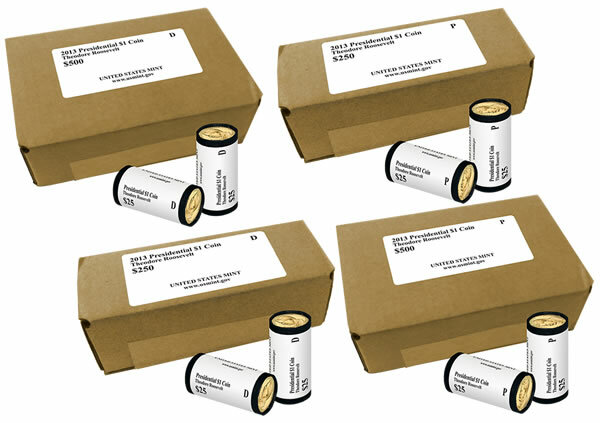 Available product options include varying quantities of circulating-quality Roosevelt $1’s in rolls, bags and boxes. These coins are the second of four 2013 Presidential dollars. The first released this year depicted William McKinley. Later issues will have obverse designs honoring William Howard Taft and Woodrow Wilson. Below is a summary of the new U.S. Mint products with $1 coins featuring Teddy Roosevelt’s portrait. 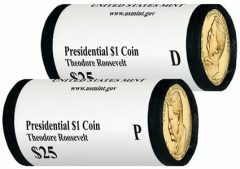 Theodore Roosevelt dollars are offered in a roll of 25 coins for $32.95. Collectors have their choice of which U.S. Mint facility the coins came from, Philadelphia or Denver. Each roll is wrapped in white paper with black edges. Printed on the wrapping is the description, "Presidential $1 Coin," "Theodore Roosevelt," "$25," and either a "P" or a "D" to show the mint of origin. Also on the wrapping is, "UNITED STATES MINT" and "www.usmint.gov." There are also 100-coin bags available, priced at $111.95 each. 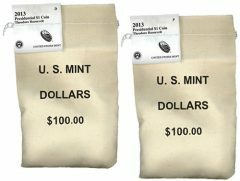 The bags are likewise filled with dollars from the Philadelphia Mint or Denver Mint. 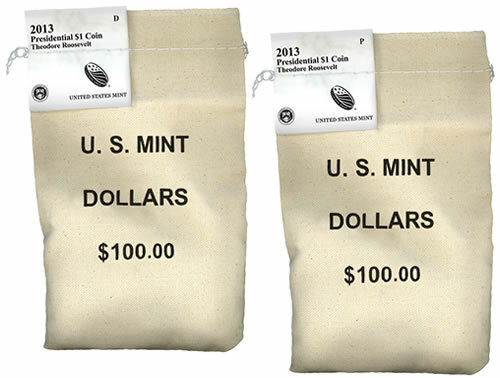 Imprinted on each canvas bag in big, bold letters is, "U.S. MINT," "DOLLARS" and "$100.00." Printed on a tag that is sewn in the upper corner is, "2013," "Presidential $1 Coin," "Theodore Roosevelt," "UNITED STATES MINT" and either a "P" or a "D" for the city. The Mint’s logo is also featured on the tag. There are four products available for the $1 in large quantity boxes. Available are 250-coin boxes that are priced at $275.95, as well as 500-coin boxes at $550.95. As before, both box sizes include options for Philadelphia-only strikes or Denver-only strikes, buyer’s choice. 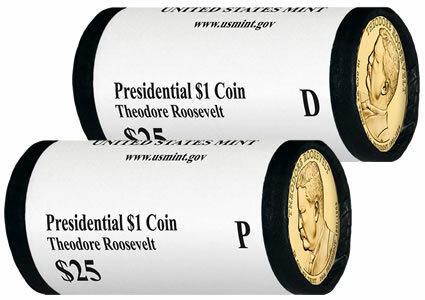 A sticker on the top of each box describes its contents in the following way: "2013 Presidential $1 Coin," "Theodore Roosevelt," "UNITED STATES MINT" and "www.usmint.gov." Also noted are the face value of either "$250" or "$500" and the mark of "P" or "D". Every 500-coin box has an extra $7.95 shipping charge due to their weight. Obverse designs of Theodore Roosevelt’s Presidential $1 Coins bear an image of President Roosevelt by United States Mint Sculptor-Engraver Joseph Menna. Inscribed on this side of the coin is "THEODORE ROOSEVELT," "IN GOD WE TRUST," "26th PRESIDENT" and "1901 – 1909." 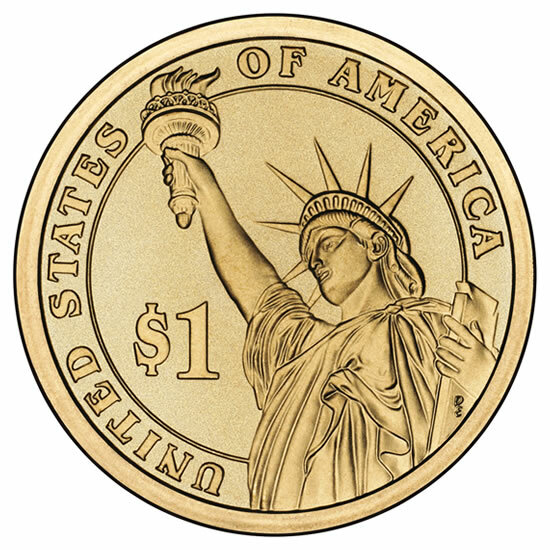 The reverse of all Presidential $1 Coins depict a rendition of the Statue of Liberty by Don Everhart. Inscriptions read, "UNITED STATES OF AMERICA" and "$1." On the edge of the coin are the incused inscriptions "2013," "E PLURIBUS UNUM," and the mint mark of either "P" or "D." Unlike collector proof versions, edge-incused inscription positions vary with every circulating-quality coin. Presidential $1 Coin specifications include a manganese-brass composition of 88.5% copper, 6% zinc, 3.5% manganese and 2% nickel. Each weighs 8.1 grams, has a diameter of 26.49 mm (1.043 inches) and a thickness of 2.0 mm. 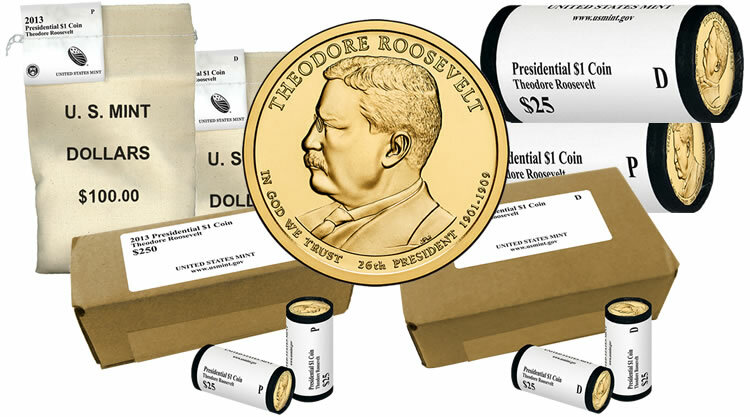 Collectors may buy rolls, bags and boxes of 2013 Theodore Roosevelt $1 Coins directly from the United States Mint’s secure web site at www.usmint.gov. Specifically, the products are found on this page. Telephone orders are accepted at 1-800-USA-MINT (872-6468). Also, hearing- and speech-impaired customers may order by calling 1-888-321-MINT (6468). There are no ordering limits on any of the rolls, bags or boxes. Theodore Roosevelt has appeared on other coins since he, along with George Washington, Thomas Jefferson and Abraham Lincoln, are sculpted on Mount Rushmore National Memorial in South Dakota. The memorial was celebrated with commemorative gold, silver and clad coins for its 50th anniversary in 1991 and was again depicted in 2006 on the South Dakota State Quarter. The U.S. Mint will launch the Mount Rushmore National Memorial quarter for South Dakota on November 4, 2013. However, its design features an uncompleted Mount Rushmore with faces of only Washington and Jefferson. Theodore "Teddy" Roosevelt was born on October 27, 1858 in New York City. In 1884, his first wife, Alice Lee, and his mother, Mittie, died on the same day and in the same home. After, Roosevelt spent most of the next two years on his ranch in the Badlands of Dakota Territory (North Dakota). It was there that he overcame his sorrow while living in the saddle, driving cattle and hunting big game. As a deputy sheriff, he hunted for and captured three outlaws. Theodore Roosevelt married his second wife, Edith Carrow, while on a trip to London in December of 1886. A U.S. Mint First Spouse coin honoring her will debut later this year. Roosevelt was a colonel of the Rough Rider Regiment during the Spanish-American war when he led charges up Kettle Hill and San Juan Hill on July 1, 1898. He was posthumously awarded the Medal of Honor for his actions on that day. In 1898, Roosevelt ran for governor of New York and won. He quickly garnered a strong reputation among Republicans and that helped him become William McKinley’s running mate for the 1900 Presidential election. McKinley won but was assassinated shortly after with Roosevelt resultantly assuming the nation’s top office. Historians tend to rank him as among the top five presidents. Choosing not to run for another term and his presidency ending in 1909, Roosevelt toured Europe and went on an African safari. On his return to the United States, he quickly became frustrated with William Taft, the man he had supported and who had succeeded him as President. In 1912, Teddy ran for president again, only this time it was for a progressive party. He said to reporters once that he felt like a bull moose, the name of his new party. He lost in a splitting of the vote. Woodrow Wilson, a Democrat, was elected with 41% of the popular vote compared to Roosevelt’s 27% and Taft’s 25%. Theodore Roosevelt died of a heart attack in his sleep on January 6, 1919 at Oyster Bay on the north shore of Long Island.